The people of the Wrothgarian and Dragontail Mountains, Orcish smiths are prized for their craftsmanship. Orc troops in Heavy Armor are among the finest in the Empire, and are fearsome when using their Berserker Rage. Both the increased damage delivered and reduced damage taken stack multiplicatively with other effects. Berserker Rage has no effect on spells. You will not do more damage with magic nor take less damage from magic while under its effects. StalwartCC (FormID FE000873): Your Orc blood gives you 15% resistance to hunger and fatigue, and increases your resistance to cold environments by 10 points. Bonuses to both one-handed and two-handed weapons allows players to choose their weapon styles early-on, and they receive an early benefit to augmenting their weaponry with bonuses to both Smithing and Enchanting. These combined with a strong bonus to Heavy Armor give Orcs the opportunity to become very fearsome warriors. However, to balance their potency in physical combat, they have no benefits for magic or stealth character builds. Their Berserker Rage power is extremely useful at all levels, potentially making the difference between life and death at earlier levels against stronger opponents. Because it has no effect on magic, try to save it for combat against tough melee or archery opponents for best results. Orc players are automatically Blood-Kin to the Orcs of Skyrim, providing them with full access to all Orc Strongholds. "I'll show you a real fight!" "No one bests an Orc!" "I'll shatter your bones like glass!" "I'll have your head for a trophy!" "Pray to your gods for mercy!" "Pray to Stendarr while you can!" Fighting elves "Die little elf!" When being taunted "Die, you Orc filth!" 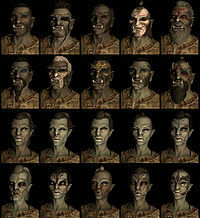 Orcs are the only race in Skyrim that do not have any passive racial abilities. This page was last modified on 3 June 2018, at 18:31.